"Perkins Opera House 1, Monticello, FL" by George Lansing Taylor Jr. 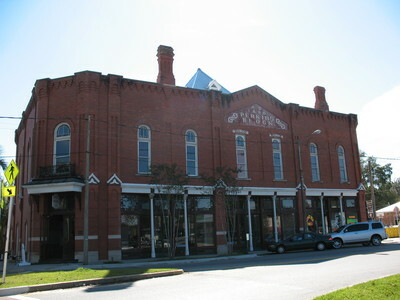 The Perkins Opera House (also known as the Monticello Opera House) is a historic theatre in Monticello, Florida. It is located at the corner of Washington Street and Jefferson Street. The Perkins Block was built in 1890 by Monticello businessman John H. Perkins. This building included three first floor bays housing Perkins' mercantile interests - a general store and sewing machine shop, a hardware store and a farm implement supply store. The second floor included a large foyer and opera house, which staged live performances, but did not go for long. In 1972 it was restored as the Monticello Opera House. It is run by a Non profit Corporation. The Opera House includes a banquet, meeting or reception area on the ground floor, a unique theater on the second floor and a picturesque garden. Our building serves as a civic center for all of Jefferson County. .The Perkins Opera House, also known as the Monticello Opera House, was added to the U.S. National Register of Historic Places on September 14, 1972. It is believed to be haunted by John H. Perkins who built the opera house in 1890. Taylor, George Lansing, Jr.; Lance Taylor; Photographers -- Florida --Jacksonville; Photograph collections -- Florida -- Jacksonville; Perkins Opera House; Monticello Opera House; Perkins Block; Meeting & reception area,Theater; Civic Center; Jefferson County (Fl. ); Theaters --- Florida --- Monticello.